Where Is Fashion Going In 2016? It’s a question you may well ask. And one there is no simple answer to, I’m afraid. Quite frankly, it’s going all over the place right now – but far from this being a nuisance, it’s an absolute joy to be embraced. The loose cannon that is fashion is firing off in all directions, landing glorious strikes in vogue-ish corners far and wide. So how exactly will this modish madness translate to the stuff in your wardrobe? Hmmm. Good question. 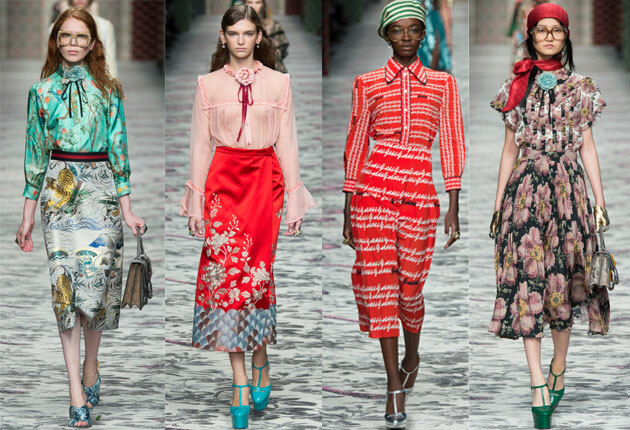 Here are some speculative insider tips on where to place your fashion bets this season…. The 70s, 80s and 90s are all considered significantly in the past by whipper-snapper fashionistas to be regarded as vintage/retro/antique. Whatever you want to call it, influences from these decades feature widely in many fashion collections this year. Whether it’s embroidered folksy cheesecloth confections from the ’70s, padded shoulder jackets and pencil skirts from the ’80s or grunge, neon and cone-bras from the ’90s – there are traces of all these style-leading elements in much of today’s fashion. Nothing ever stays still, it’s a constantly evolving buzz of creative ideas bleeding into all areas of modern culture. The speed with which fashion trends make the journey from catwalk to online clothes store has increased. Today, leading online fashion retailers like www.ffomo.com stock an ever-changing inventory of clothes and shoes for women and men that track the trajectory of current trends and translate them into wearable, easy styles. For clothing that taps in to the Zeitgeist but doesn’t leave you eating toast for the rest of the month, check out FFOMO for its latest arrivals. Romance as a theme is something we should all be embracing in the way we dress this year. And how better to express this fine sentiment than with a frill, or fifty. Going big with the frills, whether it’s on bell-shaped sleeves, maxi skirts or knitwear, you’re going to notice them everywhere. Soft, rippling frills accentuating femininity and also a take on ruffled dress shirts for a more androgynous feel will all be in evidence. The two key shades mooted as power-tones in the style spectrum are pale pink and dusky blue, both romantic, evocative and gentle – and perfect in frill-form. Mid-length and ankle-length dresses and skirts will be pushing hard this season. Great for those who like to keep their shins under wraps, these forgiving silhouettes will be offered up in lace, suede, leather, stripes, net, chinoiserie and more. Nothing beats a maxi skirt teamed with the ultimate cashmere jumper for a spot of low-key, high-style point scoring. Feet this summer will be the centre of attention when they are wrapped in dramatic lace-up gladiator sandals. We’ve moved on from the flatties of a couple of years back, now we have gladiator sandals with chunky heels that lace up to the knees. Channel your inner Roman Goddess and get shod in footwear that compliments your status. Presumably evolving out of the need for gripping a mobile phone at all times, the hands-free strap over handbag will gain currency. It’s practical, but also damn pretty with some really lovely designs coming down the pipe. Bags are getting slimmed down and the half-moon shape will become a chic staple in soft leather dyed in rainbow colours. Jewellery will see a preponderance of gold bangles and fizzy neck chains glinting under the low light of cool dives. Face jewellery will continue it’s march into the mainstream with everything on the visage real-estate being up for ornamentation. Knitwear has been quite restrained and unfussy recently. That is all about to end with a new breed of ultra-detailed, busy knitwear designs to get you noticed. Whether it’s a weird slant on a neckline, pleats, folds, knots, punched out details or simple ties and twists, the days of the simple woolly-pully are over. With a big nod to 80s knitwear excess, the new styles are bound to please a fresh audience all over again.